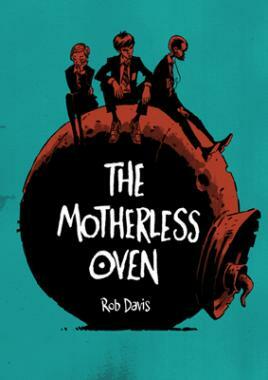 Undoubtedly one of the most unique stories we were particularly taken with the concept behind Rob Davis’ ‘The Motherless Oven’. 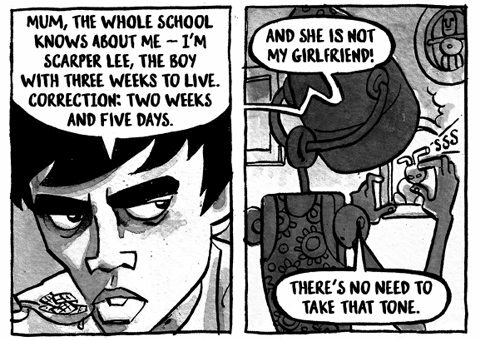 Set as a three part trilogy of graphic novels the story starts with The Motherless Oven. Set in a Britain that although looked not too dissimilar to our very own, but in which children are raised by ‘weather clocks’ and ‘can openers’ we get a chance to delve into protagonist Scarper Lee’s terrifying life, where knives rain from the sky and each household has their very own ‘god’. In the midst of which, Lee ventures out of the relative sanctuary of his daily life to pursue adventure and to seek the potential fate of his father with mysterious new school friend ‘Vera Pike’. You might know Rob’s work from his previous exploits on Roy of the Rovers and his adaptation of Don Quixote. 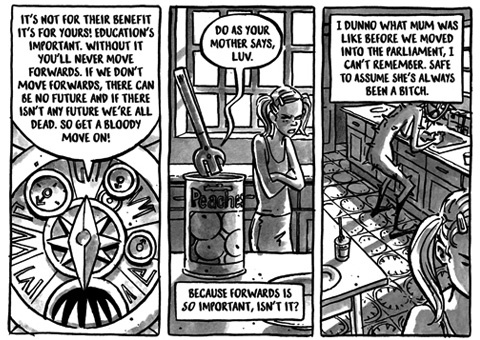 The Motherless Oven is a whole other kettle of fish, phenomenally surreal and constantly keeping you on your toes. From the first two pages alone depicting steak knives falling from rainclouds atop the relatively familiar suburban calm of a quiet British street, you’ll be mesmirised by this refreshingly new tale. With every page depicting a host of unusual elements that make the novel something completely of it’s own. But amidst the unusualness of the story, the familiar tale of teenagers rebelling against a seemingly unjust authority is one that’s all too relatable and makes it an instant classic in our opinion. The teen dialogue is hugely believable and you’ll be itching to know the fate of Scarper’s absent father, and the motives and background behind the enigmatic Vera. So needless to say we were hugely looking forward to the followup to The Motherless Oven ‘The Can Opener’s Daughter’ released last month on Self Made Hero. 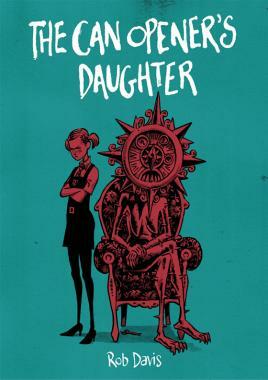 Concentrating on the back story of the mysterious Vera Pike from The Motherless Oven set in Grave Acre, The Can Openers’ Daughter shows a whole new angle to the twisted surreal world of Rob Davis we were introduced to. 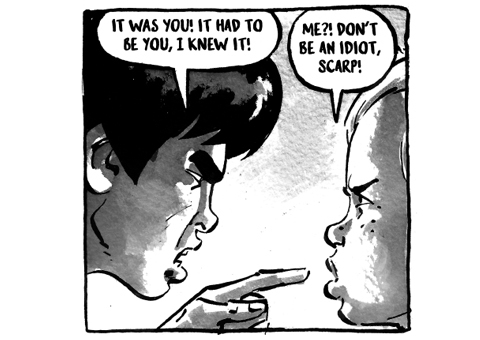 Along with a totally new point of view against Scarper Lee’s exploits in the first volume. Against Scarper’s relatively mundane life in suburbia, Vera’s is one of initial prestige being the daughter of the Weather Clock the Prime Minister of Chance. Starting with Vera’s backstory The Can Openers Daughter presents a welcome chance to see a whole new part of this unique universe Davis has crafted, from the prestigious parliament right through to the dark Black Woods. It’s undeniably insane and bizarre, like relating a fevered dream to someone when you wake it’s a universe constantly turning on it’s head. But still you’ll be left on the edge of your seat, hungry to find out more and eager to discover just what happened to Vera and Castro’s friend Scarper. 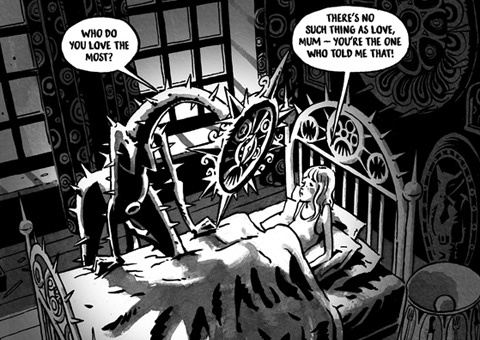 The Weather Clock is a terrifying character and it gives an intriguing perspective on an already maddened world and a glimpse at the explanations behind some of the more unusual events within the stories. Undoubtedly there’s still a wealth of story to come and like The Motherless Oven amidst the madness the familiar plight of a child rebelling against her parents is one that comes through fantastically. 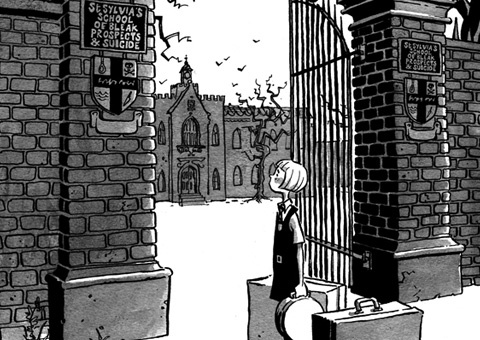 The Motherless Oven and The Can Opener’s Daughter present a hugely ambitious but phenomenally exciting series that presents something genuinely new to the seasoned graphic novel reader. Make sure you pick these up today.